Passed away peacefully on 31 March 2019 at Sir Charles Gairdner Hospital, surrounded by family. Beloved husband of Krsta Markoska, beloved father of children Koste Biljana and Irena, and beloved father-in-law and grandfather. 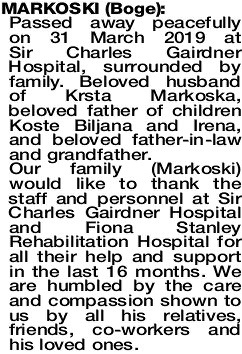 Our family (Markoski) would like to thank the staff and personnel at Sir Charles Gairdner Hospital and Fiona Stanley Rehabilitation Hospital for all their help and support in the last 16 months. We are humbled by the care and compassion shown to us by all his relatives, friends, co-workers and his loved ones.